So I just released my first game on Newgrounds, Viking Run. Check it out here if you would like. http://www.newgrounds.com/portal/view/684835. I would consider it a success. It won daily second place and got front paged but has started too fizzle out since the feature ended. Time to move on!!! I am getting excited to put my new found skills to the test with this game. I want this to be a really quick high intensity type game. You will be able to complete it in around 6 mins but the real challenge will be getting a high score. Here's the rub. You LOSE big points if you get hit. You lose MASSIVE points if you die plus have to wait a few seconds to re- spawn. I am hoping this will create a fun frantic game that makes the player think a bit about how they want to upgrade their character. I am choosing to make a really short game because if it is one thing I have learned it is that players attention spans on a free portal site are very short. Looks fantastic! I think it could become a hit. Humanoid Space Race has been published! I know what a lame journal this has been but I have been busy. Anyway, check it out here. 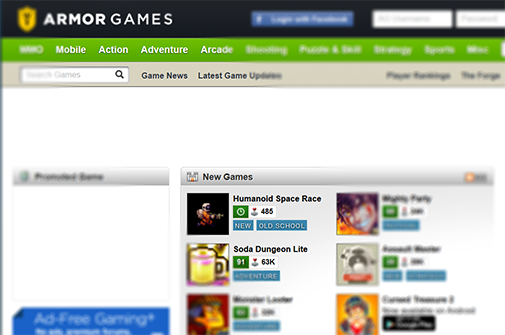 I just saw Humanoid Space Race published on Armor Games! Congrats!!! Yeah thanks! It was a $200 site lock deal so I am pumped about that! Also, I have been talking with them about a possible sponsorship deal for Save To Kill.